The organizing committee is assembling a top-notch program featuring both academic and industry presenters which will include Image restoration, storage & management, 3D & 4D image analysis, tools for high content analysis, data mining and open source developments. Aside from plenary talks and abstract presentations, we will have dedicated “Call 4 Help” sessions to team up tool providers with life scientists facing roadblocks in their image analysis, and two satellite “training schools” for “early career scientists” and “advanced Bioimage Analysts”. 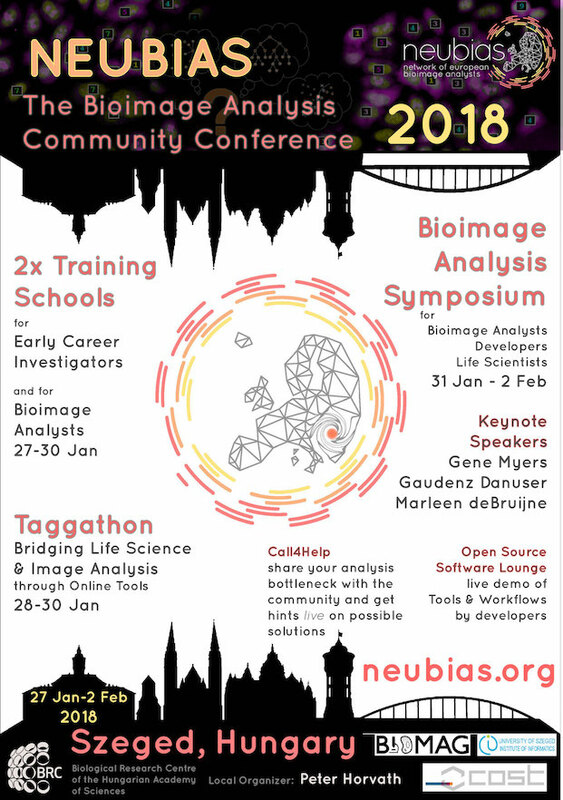 NEUBIAS Symposium will also feature the latest updates on open source software tools, components, and packages, in plenary talks and during the “Open Source Software Lounge” session which has been a great success in Lisbon, and where participants can meet developers and power users of a wide range of Open tools for Bioimage analysis in Live demo format. Digital image processing (DIP), Building workflows 2D, 3D & time-lapse, Extracting numerical data from bioimages, Toolboxes, Workflow automation (scripting).Sessions to solve your problem with an Analyst. Registration to the Training Schools open until November 9th, 2017. Registration to the Symposium open until January 5th, 2018. Abstracts submission deadline: November 11th, 2017.